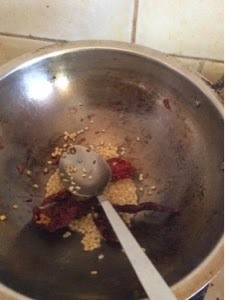 In a pan add oil and saute the urad dal and red chilli, till the dal turns golden brown. Keep it aside and Saute the cubed pumpkin in low flame for 10 minutes till the pumpkin shrinks. 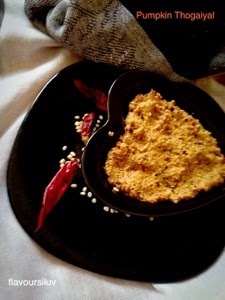 When done, allow this to cool and grind it to a smooth paste along with roasted urad dal, red chilli, salt , asafoetida, tamarind and coconut. Do not add water while grinding. The pumpkin will ooze out water. 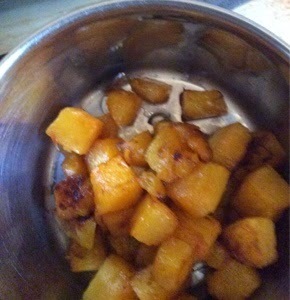 Pumpkin Thogaiyal is ready to serve. Goes well with plain rice and dosa.